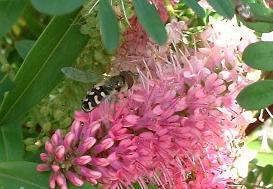 Hover flies are in the Family of insects known as Syrphidae with just two wings like all the true flies, most other flying insects have four. 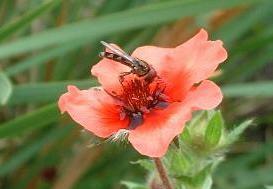 The adults feed mainly on nectar and pollen, and can be seen among the flower borders hovering near to the blossoms. There are many species and some have striking markings resembling wasps, possibly to deter predators, but for some species to gain entry to their nests. 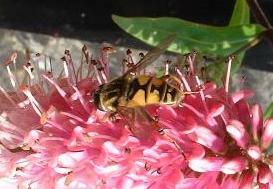 As well as looking very similar to a wasp the adult hover fly can alter it's smell to fool them and enters the nest to lay eggs. After hatching the flat larva crawls down the side of the wasp larva in it's cell and eats it, moving on to another when finished, sometimes destroying the colony. The larvae feed on aphids and other plant-sucking insects such as thrips. The female lays her eggs singly near to the sucking pests and the larvae hatch a few days later and are fully developed after about three weeks. The pupal stage which follows lasts for a further two to three weeks depending on the external conditions. There can be several generations throughout the year, but the final generation overwinters as pupae mainly in the soil before emerging the following spring. 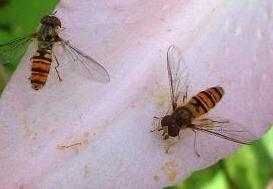 There is some commercial use of hover flies as a biological control of aphids with the added bonus of aiding pollination as the adults feed. Also the species that feed on wasps may be useful in controlling them in places like New Zealand where there is no natural predator.